In the House on Monday, January 14, Members of Parliament brought up the question of whether Malaysia is sincere in its efforts to resolve its territorial disputes with Singapore. They asked how long would Singapore’s tolerance and patience would be, given that in spite of having issued warnings, Malaysia still continues with acts of provocation. 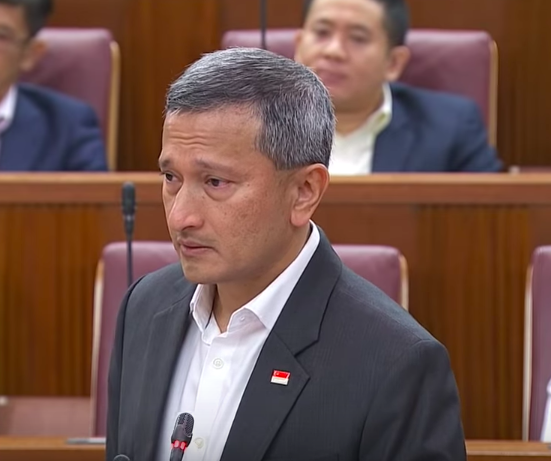 Today reports that Dr. Vivian Balakrishnan, Singapore’s Foreign Affairs Minister took a strong stand, emphasizing that Singapore has “sharp elbows.” Moreover, he said that the country has no hesitation about using these sharp elbows when it is required. Earlier, Dr. Balakrishnan made a ministerial statement in Parliament concerning the ongoing tensions with Malaysia about maritime and airspace disputes. Nine Members of Parliament had tabled questions regarding the bilateral disputes, and more questions arose after his speech. Marsiling-Yew Tee GRC MP Alex Yam noted that some citizens have been getting mixed signals from the government response to the issue, and asked if it’s time to play the part of “bad cop” so “our northern neighbors to understand… beyond doubt that any further provocation will be met with an equal reaction on our part”. The Foreign Minister said that the country does not play such ‘good cop/bad cop’ games, and nor does it have the “luxury of saying different things to different people”. The Foreign Affairs Minister also took a more diplomatic tone in the course of being questioned by the MPs, stressing that he is not an advocate of megaphone diplomacy and that he hoped that people understood the need to do certain negotiations quietly behind the scenes. However, having a strong military also makes this kind of diplomacy easier, he noted. Sembawang GRC MP Vikram Nair, the head of the Government Parliamentary Committee for Defence and Foreign Affairs, brought up the fact that one day after the meeting between Singapore and Malaysia’s Foreign Ministers wherein certain agreements were made (January 8), government vessels from Malaysia, including one where Johor Chief Minister Osman Sapian had boarded a ship that ventured into Singapore’s waters. He therefore questioned Malaysia’s sincerity. Dr. Balakrishnan had said that what Osman had done “undermined the goodwill and trust necessary for further cooperation between the two countries” and that Malaysia’s actions “created the risk for a dangerous downward spiral of measures and countermeasures”. However, he harked back to his meeting with Malaysia’s Economic Affairs Minister Azmin Ali on Sunday, January 13, wherein both agreed that attitude of officials of both Singapore and Malaysia should be one of “trying to solve and not aggravate”. He said he found that the attitudes of both the Economic and Foreign Affairs Ministers of Malaysia were “sincere, constructive and helpful” and that he hoped they were a mirror of Malaysians’ attitude in general. He also said that he saw “a way forward” regarding the disputes, though he pointed out that in retaliation, Singapore had postponed the meeting of the Joint Ministerial Committee for Iskandar Malaysia.